When you are in pain, under stress, not sleeping or simply not feeling your best, you want to get better and you want to get better FAST, right? Of course! Who wouldn’t? 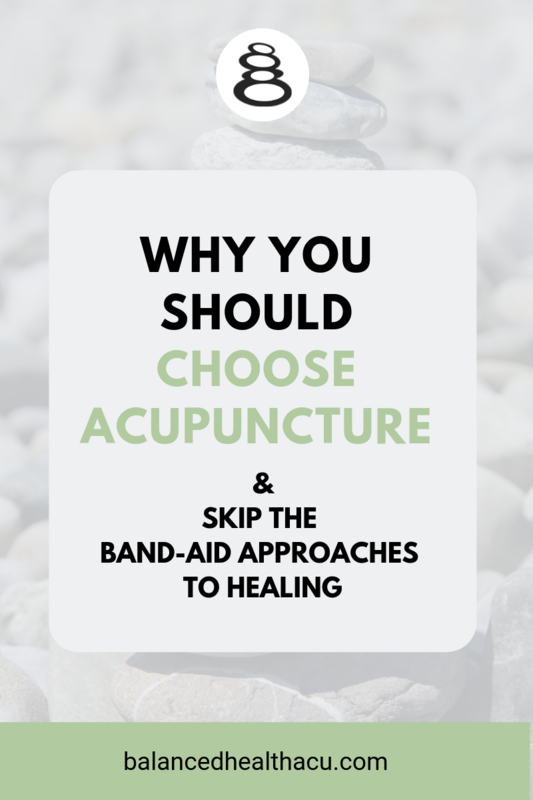 Well here’s why you should choose acupuncture as your go-to treatment of choice. Skip the Band-Aid. Treat the Cause. When you pop that aspirin for pain or that anti-acid for heartburn, you’re now addressing the cause of that pain or the reason for your heartburn. You’re simply applying a band-aid to cover up the problem that is causing you discomfort in the moment. If you ripped the band-aid off or no longer had one to apply, your problem would resurface. Acupuncture is a treatment option that skips the band-aid approach and instead addresses the root cause of your condition. Why cover up a medical problem when you can tackle it at its source? The sooner you begin to chip away at the root cause of your condition, the faster you feel better. As an acupuncturist, I tackle puzzles every day. Each of your symptoms (and often seemingly unrelated symptoms!) is a piece of the puzzle that helps me to identify the root cause of your condition and ultimately the strategy to combat this cause and provide relief. No two individuals are exactly the same so why should their medical treatment be the same? With acupuncture, I treat the individual, not the condition. This means that one treatment does not fit all when it comes to the select of acupuncture points or the treatment options used. I treat a lot of women who suffer from migraine headaches. Though many of these women are taking the exact same medications, their acupuncture treatments are not the same. Some acupuncture points may overlap, but each woman receives a treatment based on her individual symptoms and overall health condition. Don’t you want a treatment geared specifically for your health concerns and goals? In my office, your medical condition is viewed in relation to your overall health. This means that in order to understand the cause of a woman’s migraines, I must also understand the current state of her stress level, the frequency of her bowel movements, the quality of her menstrual cycle and her sleep pattern for example. Medicine should not mimic car repair where you view a problem in isolation from the whole person. A mechanic removes a non-working car part, repairs or replaces it, and then returns it to the car to fix the problem. Your health problem cannot be removed from what is the whole story of your body and how it functions. By taking this holistic approach and understanding your overall health, you not only recuperate faster (because the root cause of your problem has been identified!) but you experience improvements in other areas of your health. Back to our migraine sufferer, during her initial evaluation, I may come to find out that in addition to her migraines, she also suffers from constipation, painful periods, disturbed sleep and significant emotional stress. Although the goal of her treatment is to end the migraines, over the course of treatment it would not be uncommon for her to also notice that her bowel movements become more regular, her periods become less painful, her sleep becomes more sound and her stress level lessens. This is the beauty of acupuncture, a form of medicine that focuses on the whole person, not just the illness. This reason why you should choose acupuncture may be my favorite. Acupuncture is not just a reactive medicine. It is a medical treatment that can prevent illness and disease. That is pretty amazing! Think about it. If you catch the latest common cold going around the office, your only recourse is to treat it. You cannot go back in time and not touch that infected doorknob or not sit next to that person on the subway who sneezed all over you on the commute into work. What you can do with acupuncture, however, is strengthen your body and its immune system so that the next time you come in contact with common cold germs you can either go unscathed or recover much quicker. Strengthening your immune system is just one aspect of how acupuncture can prevent illness. Say you suffer from occasional stomach pains, gas and bloating. Why wait to seek treatment until your digestive system has become so compromised that you are now diagnosed with leaky gut syndrome or irritable bowel syndrome when you could address those symptoms now before they become worse? I often use the analogy of an iceberg when explaining the preventative nature of acupuncture. Say you are in a small boat in the ocean. You may not realize that you are coming upon an iceberg until you get close enough to see it sticking out of the water. What you don’t see however is its massive size underneath the water. Too often we wait to address a health concern only once it breaks through the surface and becomes too big to ignore; like the iceberg out of the water. By this point however, your condition has had weeks, months or even years to develop. Don’t let your health concern fester like an iceberg growing bigger and bigger under the surface. Get proactive and prevent future health problems by seeking treatment NOW with acupuncture. There are many reasons why you should choose to try acupuncture and these are but a few. If you still wonder whether acupuncture might be a good treatment option for you, contact me and I’ll give you my honest opinion. If you know someone who should definitely give acupuncture a try but who may be on the fence, share this post with them! They’ll thank you for it. Hi! I’m Leslie Murphy. As a licensed, nationally certified acupuncturist, I’ve helped hundreds of patients recover from pain, reduce their stress and anxiety, improve their sleep and energy and reclaim their health so that they can do the things they love. Curious if acupuncture can help you? Take my free, 2 minute quiz and find out! Soil Based Probiotics: Are They Safe?